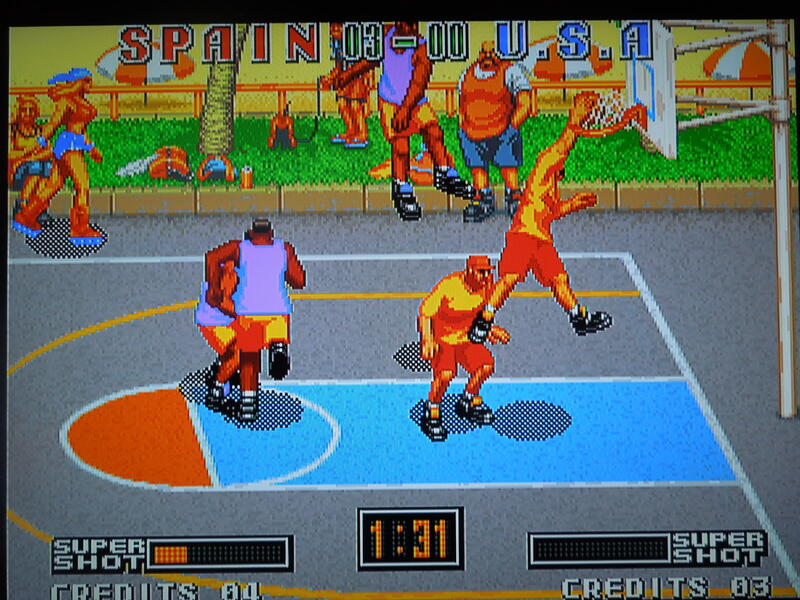 Dunk Dream (Japanese title) is known as Street Slam in the U.S. and Street Hoop in Europe. Note: This game was played on a Neo Geo AES home console that was modified to output in component video (red, blue, green). *Like basketball games? Check out my review of Nekketsu Street Basket. Quick History: Dunk Dream was released in Japan for the Neo Geo AES home console and Neo Geo MVS arcade cabinet in 1994. Dunk Dream contains similarities with NBA Jam, although it was released one year after that title, and Dunk Dream is not nearly as well-known. 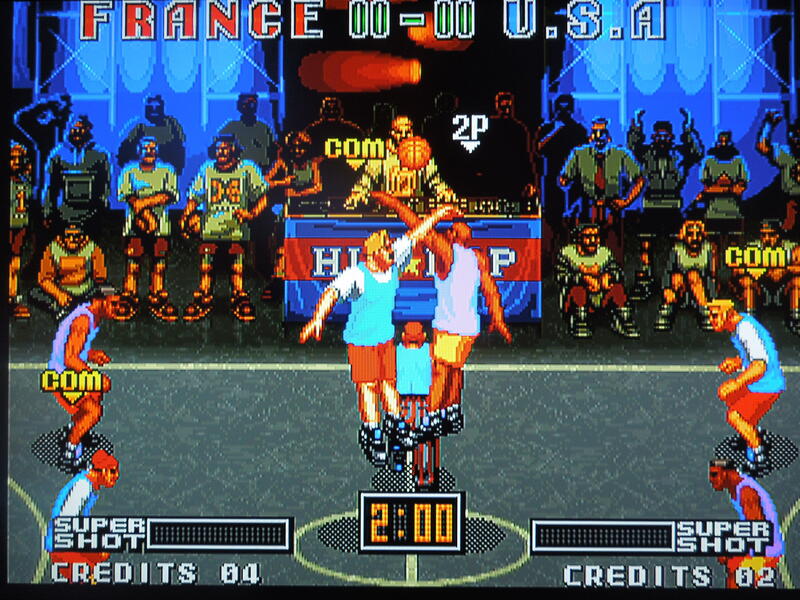 Dunk Dream also received releases in the U.S. and in Europe, although the name of the game was changed in those regions to Street Slam and Street Hoop, respectively. Neo Geo Memory Card: Once your 4 credits have been used, you can save your game to the memory card, then start back then or later where you left off. Gameplay: Dunk Dream is a 3-on-3 basketball game that features 10 selectable international teams: U.S., Japan, Korea, China, Taiwan, Italy, Germany, France, Spain, and England You select a team and play the game’s other 9 teams. Beat them all, and you beat the game. You’ll play on 3 different courts, all of which have an urbarn ‘street’ feel. If a game ends in a tie, then it’s considered a ‘Draw,’ and you’ll have to play the team again – there is no overtime. Like NBA Jam, Dunk Dream features over-the-top slam dunks and super shots. 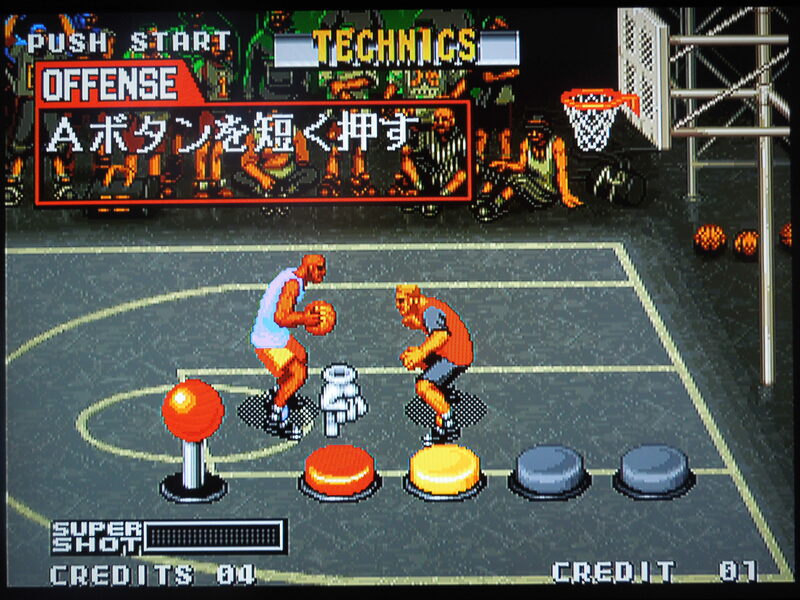 Control: Dunk Dream only uses two buttons on the Neo Geo control stick (aside from the stick itself): A and B. A shoots. You can pump-fake a shot by tapping A lightly. B passes (to your closet teammate). On defense, A jumps to block shots, and B steals the ball by swatting at it or throwing an elbow, depending on the player. You can alley-oop by shooting with one player, and if a teammate is near the basket, pressing A + B. You can set the difficulty level and game length before you begin play. Teams: Each team has their own strengths and weaknesses, broken down into 4 categories: Dunk, 3 point, Speed, and Defense. A bar indicates where each team ranks in these categories – the longer the bar, the better the team is in that area. Super Shots: After you, or the CPU, make 4 shots (they don’t have to be consecutive either), your “Super Meter” at the bottom of the screen will become full, and you can then execute a Super Dunk by pressing A inside the 3-point line, or you can shoot a fire-streaked 3-pointer from just outside the 3-point line. Dunks occur early and often. Options: At the beginning of the game, you can set the difficulty from 4 levels: Easy, Normal, MVS (arcade), Difficult. The game is not tough to beat on Easy (although that doesn’t mean the CPU is a total pushover), but you’ll probably lose some games on the higher difficulties unless you practice. You can also set the time of the game at any 15 second increment from 1 minute to 4 minutes. 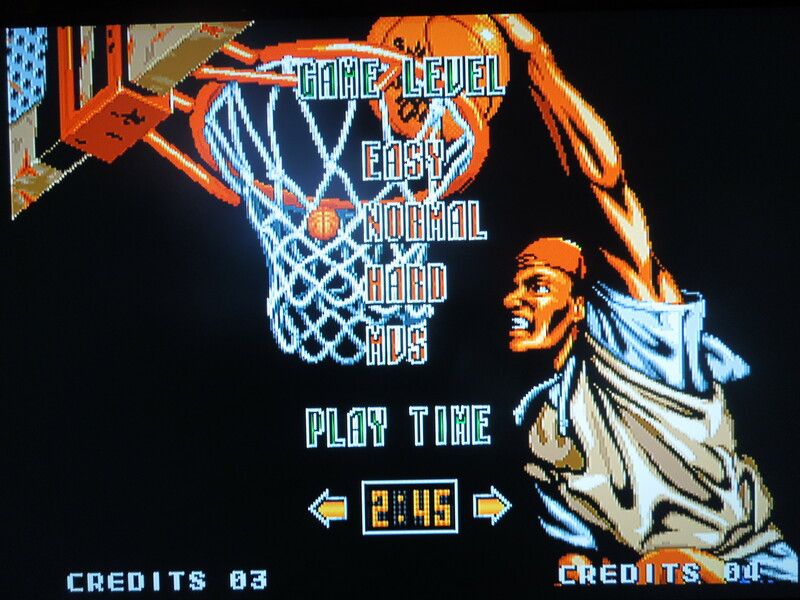 Their are no ‘halves’ in Dunk Dream, so whatever time you select is the time for the whole game – no timeouts, either. Because the clock moves quickly, it’s usually better to increase the clock to its maximum of 4 minutes. View your stats at the end of the game. Music: Outstanding. 3 relatively-corny rap songs play in the background during your matches that are strangely addictive. The songs were made just for this game, and they fit the fast gameplay and courts more than appropriately. Here’s a sample of one of the songs: “This is 3 on 3 street basketball, if you wanna jump in, you gotta answer the call!” Check out a video online to get a better idea of the music – it’s definitely cheesy, but you’ll find yourself singing it anyway. 2 players: There is a two player VS. mode, but unfortunately, no co-op mode. Language Barrier? No. The only time you’ll see anything other than English is during the ‘demo’ that shows you how to play the game, where the instructions are in Japanese. However, it only takes about 1 minute to learn the game. Dunk Dream is all in English except for the demo. So, where can I find this game? It is available in a variety of formats. In addition to the AES home console and MVS arcade machine, it was also released for the Neo Geo CDZ. It was also available on the Virtual Console for the Wii, and on a compilation disc put out by Data East. You can also play the rom on your computer. Differences between the game across regions: The gameplay is the same across regions, but minor changes were made to the game depending on what region your Neo Geo AES console is from. 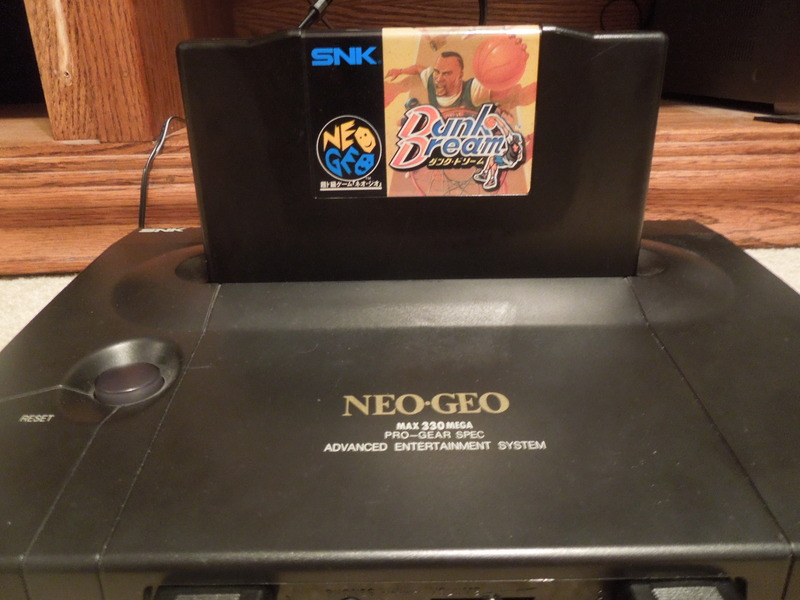 This means, for example, that if you put a copy of Dunk Dream in a U.S. Neo Geo, it would have the Street Slam settings. Conclusion: Dunk Dream is a fantastic arcade-style basketball game. While you’ll be quick to notice how similar to NBA Jam it is, I actually prefer this game. 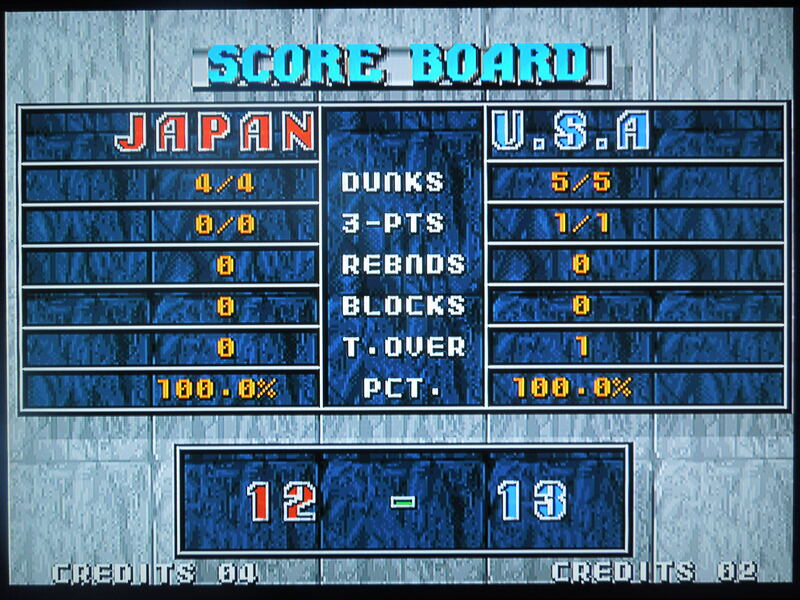 It moves a bit slower (though it’s still fast), but it controls better (in my opinion) than the more popular NBA Jam. The music, sound effects, and courts combine perfectly to create an addictive atmosphere, and the games are quick, even if you set the timer to 4 minutes. The teams are different enough that there is replayablility in trying to beat the game with different teams. For 2 player VS sports games, this game is a great choice.